LogMeIn is an excellent online service which offers a free method of remotely controlling a PC via web browser. Recently I encountered a minor glitch, however, and whether LogMeIn or Windows 7 or nVidia are the culprit, I'm not sure. I had remoted in to my Dell Latitude E6410 laptop using the latest free version of LogMeIn. It is equipped with Windows 7 64-bit and NVIDIA NVS 3100M display adapter, each with the latest updates and drivers available. All seemed fine via remote, but when I returned to the office I found that although my secondary monitor activated normally, my laptop display remained seemingly asleep and unresponsive. I tried using the key combination of the Windows key and P then clicked Extend to try to have Windows reinitialize the displays and wake everything up, but no joy. 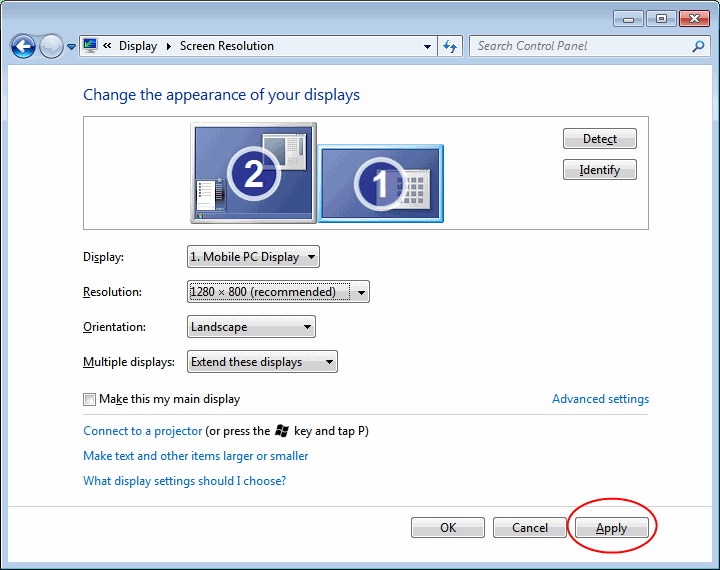 I then tried just changing one of my Display settings, the Resolution, to a different value in order to have Windows enable the Apply button, and then clicked it. After doing this, my laptop screen was no longer blank.